Seeking some enthusiastic community volunteers! Goulburn Valley Regional Training Hub (GVRTH) is currently coordinating a community mentoring program for medical students and trainee doctors. 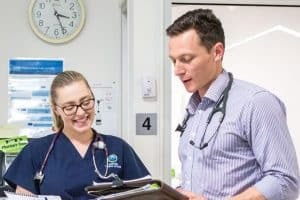 The GVRTH is part of a Commonwealth program, managed by the University of Melbourne’s Department of Rural Health, to improve training opportunities for trainee doctors in rural and regional Australia. Rurally based medical students and trainee doctors often face stressors in relation to relocating on top of existing academic stress. For many, their time training in a rural or regional location will be their first time living away from home. We are currently seeking community mentors for students and trainees in locations where they will be doing their clinical practice, to help them settle in to the local community. Community mentoring is voluntary for both mentors and mentees. A community mentor is a friendly face, not associated with the pressures of work or study. You don’t need any special skills or qualifications to become a community mentor, but can help by assisting trainee doctors feel more at home in the local community through shared activities such as catching up for a meal or a coffee once a month, or participating in a shared interest.